The American flying boats, the Consolidated PBY Catalina were Lend-Leased to the Soviet Union, with Soviet-British crews when we all were allies during World War II. How were they transported? Those in the picture are flying somewhere in the north. We've created a map with America at its center to show all the routes. There was a classic route from Elizabeth City, North Carolina, via the Bering Strait to Vladivostok. By the way, those planes would take part in the liberation of the Kuril Islands. Another route was a northern one as well via Iceland and the north of Norway to Murmansk. The most exotic one was via Trinidad and Tobago in the Caribbean, the Amazon delta, the Atlantic ocean to Africa, then via Sahara, the Middle East (Iraq, Iran) to Sevastopol. Then those planes would take part in the landing operations in Romania and Bulgaria. Obviously, accidents occurred during those flights, and we should cherish the memory of the heroic crews, including Soviet-British and American ones. But due to the expulsion of Russian diplomats among other things, an awkward issue has arisen. The USA is afraid of organizing a memorial to them. Why? Our colleague Alexander Rogatkin is reporting from the USA. The US flying boat, the Catalina. It was Lend-Leased to the USSR during World War II. This one is about 75 years old, and it will try to hit the skies. The plane accelerates on the runway. The pilot listens attentively to the engines and yet doesn't dare to raise the veteran aircraft into the air due to the strong crosswind. El Nitz, chief of the military aircraft repair shop: "It's very difficult to control, with its heavy steering wheel and pedals. It's hard to fly it". At the beginning of the war, German bombers destroyed almost all Soviet seaplanes, 600 flying boats which were vital for the Navy. The supplies from the USA weren't agreed upon until 1944. Catalina had powerful weapons and an excellent view. Shooters were sat in a glass gunport, which was easy to open. One could look down at the ocean, searching for downed pilots. It was also possible to shoot the machine guns both at enemy aircraft and ships. 160 Catalinas were supplied to the Soviet Union. One crew with Colonel Vasilyev, who headed the air group, crashed in June 1944 in Norway. There was another accident. On January 11, 1945, a Catalina with a Soviet-British crew took off from Elizabeth-City only to lurch onto the wing and fall into the Pasquotank River, seconds later. Five members of the crew died, four Soviet pilots and one Canadian radio operator of the British Royal Air Force. The others were rescued. Maxim Alekseev, Russian Ministry of Defense: "The rescuers saw some crew members on the plane, they began to save them, then they saw the navigator emerge on the surface, I mean, Soviet navigator Valentin Levin emerged. Then he went under again, lifted the Briton whom he saved from the cockpit and who was trapped by the debris and couldn't get out by himself. He actually saved him, but drowned". Navigator Valentin Levin was brought to the Soviet Union to be buried at the Donskoy cemetery. No one knows what happened to captain Chikov and two technicians. Several years ago there was an idea to put a monument to pilots who participated in the Zebra project. A model was already done. The monument to the pilots of the three allied armies was to be installed in the very center of Elizabeth City, on the embankment of the river which took their young lives. But it turns out, that now's not the time. The city council banned the monument because of the complicated political situation between Russia and the United States. Richard Olson, city manager: "I have no opinion on this, the city council decided that the statue should not be installed, that's all I can say". The city council quite seriously said that Russians could insert spy equipment into the monument and connect to local computer networks as Elizabeth City hosts the Coast Guard database, and neighboring Norfolk hosts the naval station of the US's aircraft carriers. Richard Olson: "One of the residents spoke at the council meeting. He said it was dangerous as the Russian government was participating in hacker attacks on the US, in particular during the 2016 presidential campaign". "And I would hate for us to put up that Zebra, monument, we have a dispute with Russia two years from now, all of a sudden everything in Elizabeth City blacks out for some reason Russia is known for hacking now". The idea of a Trojan horse of Russian hackers was put forward by John Walton at the city council meeting. But for some reason, he refused to repeat his ingenious assumption in front of our camera. John Walton: "I'm at home, I won't tell you anything, go away". Music teacher Billy Cowdel along with 3 more council members voted to install the monument, but they were outvoted. Billy Cowdel, Elizabeth City council member: "This monument is a great gift of the Russian state to our city. 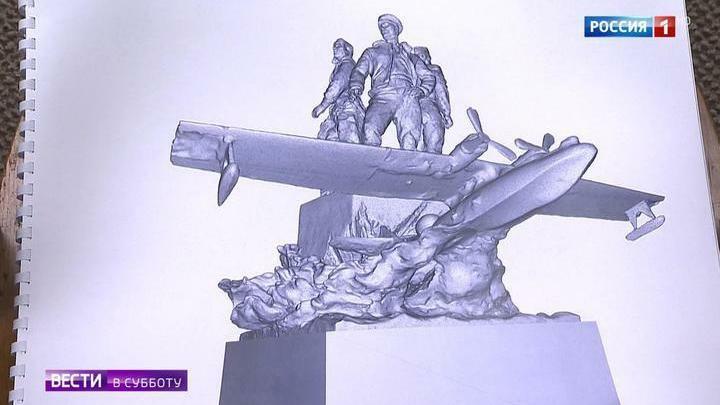 It's the monument not only to Soviet pilots, but also to the British, and the Americans, who all fought together". The owner of a Catalina also wonders how Russian hackers managed to hack the historical memory of most of Elizabeth City's city council members. Gerald Jagen, military equipment collector: "America is no longer an ally of Russia, that's the problem. But we mustn't forget that not only our soldiers died but Russian soldiers as well". Gerald Jagen owns a private WWII aviation museum in Virginia. His collection includes rare Yaks and MiGs. They are not only in perfect condition but can also fly. Gerald Jagen: "I wonder why a monument to the armies that were fighting together back then can't be installed due to the problems America and Russia have today. People come to the museum and they do not know anything about the Russians. They see a Russian plane and think: "Um, this is a Russian plane." But they have no idea we were fighting side by side in that war against Germany and Japan". This monument would probably adorn a small cozy American town where the main attractions are a water tower above the city hall, geese on perfectly cut grass lawns and an indispensable star-striped flag on each house. Maxim Alekseev: "Common sense will triumph, people should understand that this is our common history, it did happen, it's the truth. The two great nations did fight against evil. Such things must not be forgotten or soiled". Maxim Alekseev was charged with military and memorial work in the Russian embassy by the Ministry of Defense. He spent several years searching for participants of the Zebra operation. He negotiated the installation of a monument to three Allied pilots. This week, the US State Department has put him on the list of the diplomats to be expelled. And Alekseev has to pack up urgently. Maxim Alekseev: "It's a pity the monument hasn't been installed yet. Everything was ready, everything went smoothly, everything was fine, an excellent project, a beautiful theme, everything was wonderful, but something went wrong at the last moment. It's frustrating". The monument will certainly be installed. Gerry Jagen, a businessman from Virginia, has already contacted our embassy and offered the territory of his airfield and museum to install the monument there. Gerald Jagen: "Since we can not put the monument in Elizabeth City, we will simply do it here, in Virginia Beach. And a huge number of tourists who come here will see Soviet planes, a Soviet hangar, and the monument". This is his private land, and no one can prohibit him from commemorating the soldiers of World War II. Alexander Rogatkin, Valentina Rudkevich, Dmitry Rogalev for Vesti — Saturday News from the USA.